One of the most enjoyable parts of attending the National Planning Conference for me has become the opportunity to serve as a mentor through the APA Mentor Match program. I volunteered the first year of the program and have found that, not only do I get to meet young planning professionals who inspire me, I make friends and connect with new colleagues. I can honestly say l feel the investment of time is minimal compared to the rewards. 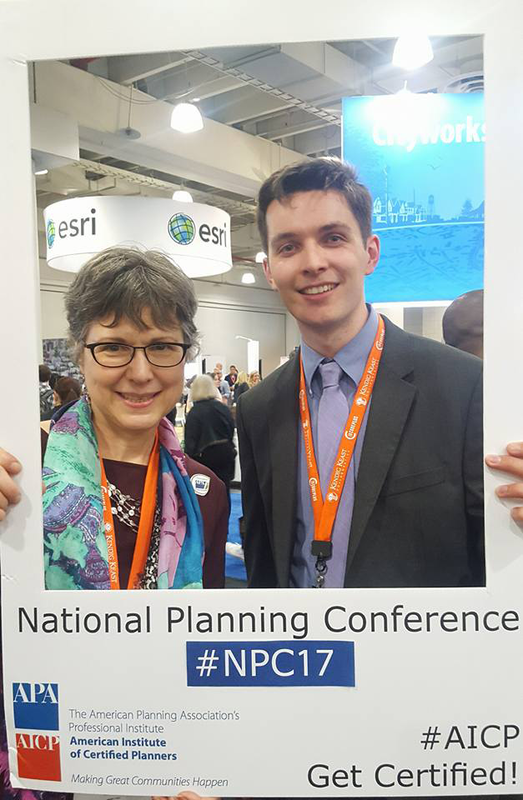 Cynthia Hoyle, FAICP, mentored Thomas Hillman at the 2017 National Planning Conference. Photo courtesy Cynthia Hoyle. Let me tell you about one of my NPC 2017 proteges. This year I was assigned to a very bright and delightful young planner named Thomas Hillman (he gave me permission to include him in my blog post). Thomas works in transportation planning, a field I have been passionate about for 30 years. The field has changed a lot in that time with digitalization and more focus on active transportation modes, but the basics remain the same — it’s all about providing access to safe and equitable mobility for all our citizens. Thomas and I arranged to meet and spend time together at the Meetup and Mixer the first night of the conference. In our conversations I learned about how he is using data to create better analyses that improve the safety of our transportation systems. I shared my thoughts and experiences on issues ranging from how to advance in the field to how to balance two career relationships. Prior to coming to New York City, I was contacted by one of my proteges from three years ago who is attending the NPC this year. She has kept in touch through LinkedIn, and we made plans to meet and catch up. Getting to hear about how much she is enjoying her new job and how life is going is a joy. I have met with one to two younger planners each year at the conferences. They often ask me about the difference in working for the public and private sectors, how to make decisions about the next steps in their career, etc. I always share with them two important pieces of advice. The networking opportunities and friendships they develop will be one of the best things they can do for themselves and their careers. I have served as a Chapter President, I was Chair of the Private Practice Division, and most recently served on the AICP Commission. As a result of my involvement with APA and AICP I have friends all over the U.S. and around the world. These connections have benefited me in multiple ways. When my family was considering a move I was able to seek out and talk with APA leaders from the communities we were considering and when we moved I was immediately connected to the planning community in my new home. When I have had the opportunity to travel abroad I have sought out and connected with planners in other countries. Plus I have very dear lifelong friends I have made through APA. AICP certification provides you with solid credentials that give planners an advantage in job applications and provide one of the strongest code of ethics among professional organizations. The continuing education requirements for AICP maintenance demonstrate commitment to staying current and well prepared, something employers are seeking. As a member of the AICP College of Fellows I can share that I have never once regretted becoming a planner. It has been a career that has encompassed both my professional and personal passion to make the world a better place. Connecting with the next generation of planners gives me not only the opportunity to share my experiences but to see that the future of planning is bright as these smart, capable and enthusiastic young planners taking the reins from my generation to take us into the future. Top image: The author with her former University of Illinois students Silvia Danqi Fang and Yuchen Ding. Photo courtesy Cynthia Hoyle. 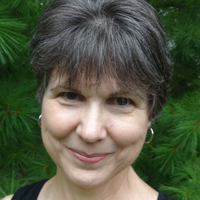 Cynthia Hoyle, FAICP, is a transportation planner with Alta Planning + Design from Urbana, Illinois.